4" Heel Two Tone Sandal. 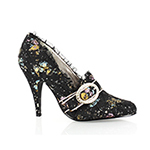 4.5" Decorative Fabric Pump W/Rhinestones. 4.5" Decorative Fabric Peep-Toe W/Rhinestones. 4" Heel with strap details.